Gethsemane means "oil press". The current garden contains over half a dozen ancient olive trees. Josephus tells us that Titus had all trees in and around Jerusalem cut down in 70 A.D. Did these trees escape the ax or did they grow again from the trunk that remained? Either way, it is a fitting image for the Christian faith in such significant place. For it was here we remember how Jesus prayed on the night he was arrested (Matthew 26:36-56; Mark 14:32-49; Luke 22:39-53). 50: And Jesus said unto him, Friend, wherefore art thou come? Then came they, and laid hands on Jesus, and took him. 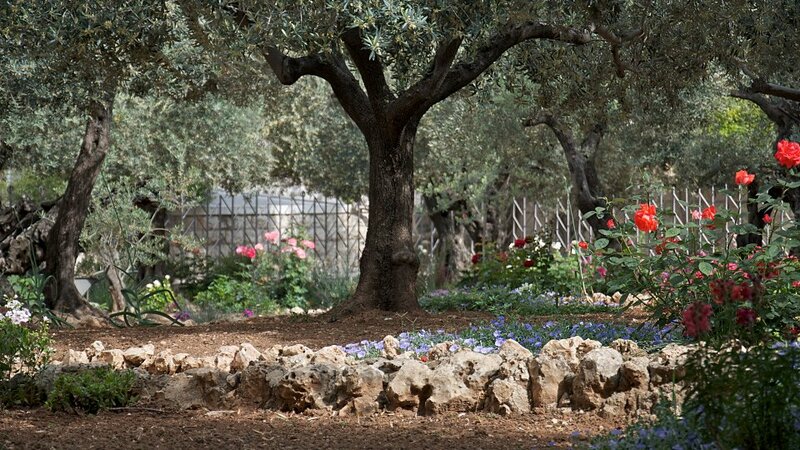 Jesus commands His disciples to watch and pray only to find them asleep when He returns to them here in the Garden of Gethsemane. How frequently the Christian finds his defenses lowered and falls into sleep (both physically and metaphorically). Paul in his letter to Ephesians reminds the church that they were not facing incompetent foes but principalities, powers, and spiritual wickedness. Thus, to fight the enemy the Christian should take the full armor of God, pray, and be vigilant of the enemy.